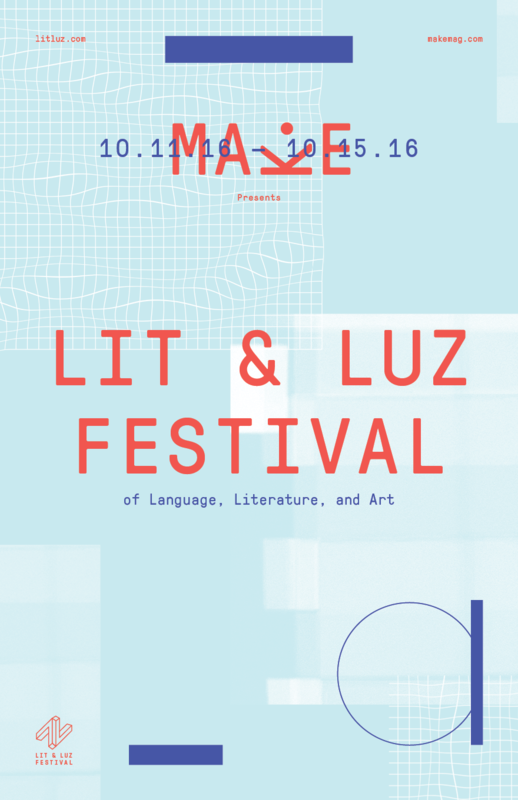 The third annual Lit & Luz Festival, presented by MAKE Literary Productions, kicks off October 11th in Chicago. The weeklong binational and bilingual series features some of the most innovative contemporary work from renowned authors and visual artists from Chicago and Mexico City. Readings, conversations, artist talks, performances, panel discussions, and a culminating Live Magazine Finale, are presented in both English and Spanish with live translation and supertitles. Begun in 2014, the Lit & Luz Festival grew out of the pages of MAKE magazine’s Intercambio portfolio, which has featured over 40 writers to date, many in English translation for the first time. In the United States, English translations of foreign works make up only 3 percent of all works published, and less than 1 percent of those are new works. MAKE magazine and the Lit & Luz Festival offers Chicago audiences the rare opportunity to experience the work of some of Mexico’s most acclaimed writers and artists, alongside the city’s brightest cultural talent. The theme of this year’s festival, “(Anti-)Static,” seeks to be a catalyst for movement forward and can be interpreted as encompassing, among many other things, ideas of progression, motion, controlled chaos, and development (for or against). Gozamos is a proud media sponsor of the Lit & Luz Festival. Guadalupe Nettel’s many awards include Herralde Novel Prize, Gilberto Owen National Literature Prize, and the Antonin Artaud Prize among others. Her much-acclaimed titles Natural Histories (7 Stories Press NY) and The Body Where I Was Born (7 Stories Press NY) have been translated into English. She lives and works in Mexico City. Luis Felipe Fabre is a poet and critic based in Mexico City. He has published a volume of essays and poetry collections. Recent books of poetry include Poemas de terror y de misterio (2013) and Sor Juana and Other Monsters (2015). The latter was translated by John Pluecker has been published by Ugly Duckling Presse. Events will be presented in both English and Spanish. Lit & Luz, Poetry Foundation, and Señal Books present Señal Night with Florencia Castellano, Luis Felipe Fabre, Pablo Katchadjian, and Gabriela Jauregui. And special guest translators, Alexis Almeida, Stalina Villarreal, JP Pluecker, and Rebekah Smith. Hosted by Brenda Lozano. Co-presented by the Poetry Foundation & Poetry Magazine, along with Señal Books. A conversation on translation with Alexis Almeida, Luis Felipe Fabre, JP Pluecker, Rebekah Smith, Stalina Villarreal. Hosted by Daniel Borzutzky. Méndez Blake will present images and discuss his sculptures and installations, which have been exhibited world wide. Co-presented with the Latin American and Latino Studies Department at UIC. Food, drinks, and pop-up performances by Lit & Luz participants. 12 pm at University of Chicago Katz Center, 5848 S. University Ave. Featuring debut collaborative performances from Gabriela Jauregui + Susy Bielak & Fred Schmalz, Jorge Méndez Blake, Guadalupe Nettel + Vu Tran + Amanda Gutiérrez, Daniel Saldaña París + Jessica Anne, Alejandro Albarrán Polanco. This event will move between Spanish and English and through the theme, “(Anti-)Static” or “Motion,” explore the contexts in which both Chicago and Mexico City exist. Suggested donation.